Another delicious seafood salad this I have here is the pineapple shrimp salad. This salad recipe is very easy to prepare and need no for a skilled cook. If you know how to make a sandwich, then you can make this. The only tricky part is preparing and cooking the shrimps. If you bought fresh shrimps, then you have to cook and peel it or to make your life easier, buy frozen peeled shrimps. And a little tip for preparing the lettuce, soak it in water with a teaspoon of baking soda for at least 10 minutes. 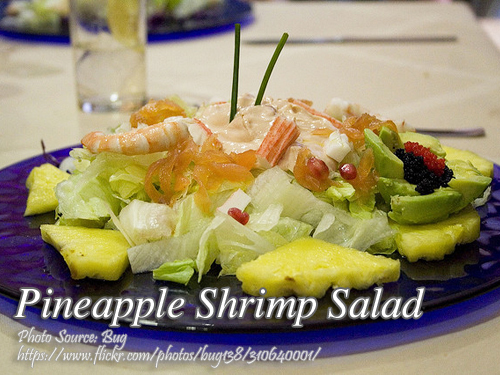 To make pineapple shrimp salad; Arrange lettuce leaves in a salad bowl. Put shrimps, pineapple, pepper, carrots, olives and tomatoes together to form a mound of the mixture on top of shredded lettuce leaves. To make the dressing, combine mayonnaise, chili sauce, Worcestershire sauce and pepper in another bowl. Spoon dressing on top of the salad. Serve cold. Arrange lettuce leaves in a salad bowl. Put shrimps, pineapple, pepper, carrots, olives and tomatoes together to form a mound of the mixture on top of shredded lettuce leaves. To make the dressing, combine mayonnaise, chili sauce, Worcestershire sauce and pepper in another bowl. Spoon dressing on top of the salad. Serve cold.